New commemorative US stamps issued during 1928 and 1929 continued to honor significant events from the Revolutionary War, as well as other milestones of the period. The 2 Cent denomination stamp shown above (Sc. #645) was issued on May 26, 1928 to celebrate the 150th Anniversary of the Encampment of General George Washington's Army at Valley Forge, Pennsylvania. The stamp depicts "Washington at Prayer". Valley Forge, about 20 miles north of Philadelphia, was the site of the encampment of the Continental Army over the winter of 1777-1778. Starvation, disease, and exposure killed nearly 2,500 American soldiers by the end of February 1778. The 2 Cent definitive postage stamp issue of 1926 was overprinted Molly / Pitcher (Sc. #646) on October 20, 1928 to celebrate the 150th Anniversary of the Battle of Monmouth and of its heroine, Molly Pitcher (Mary Ludwig Hayes). The Battle of Monmouth was fought on June 28, 1778 in Monmouth County, New Jersey, between the Continental Army of George Washington and a British Army commanded by Lieutenant General Sir Henry Clinton and Lieutenant General Charles Cornwalis. Mary Ludwig Hayes was the wife of an American artillery man who lived near the battlefield. She brought water for swabbing the cannons and for the thirsty artillery crews, helped her husband with his wounds, and then took his place in battle, when he could no longer fight. The artillery men gave her the nickname "Molly Pitcher", when she was bringing them water from a nearby spring. The 2 Cent and 5 Cent definitive postage stamp issues of 1926 were overprinted Hawaii / 1778-1928 (Sc. #647-48) on August 13, 1928 for the Sesquicentennial Celebration of the Discovery of the Hawaiian Islands. The stamps were only placed on sale at post offices in the Hawaiian Islands and at the philatelic bureau in Washington, D.C., though they were valid for postage throughout the continental United States. The Sesquicentennial celebration of Captain Cook's discovery of Hawaii was held in the Hawaiian Islands from August 15 through August 21, 1928. The U.S. Mint also coined a commemorative half dollar for the event, which is very scarce today. The two US stamps shown above (Sc. #649-50) were issued on December 12, 1928 for the International Civil Aeronautics Conference, held in Washington, D.C. December 12-14, 1928. They also commemorate the 25th Anniversary of the Wright Brothers First Airplane Flight on December 17, 1903. The 2 Cent denomination shows the Wright Brothers' Airplane, with the Washington Monument and the U.S. Capitol Building at the sides. The 5 Cent denomination shows a contemporary Monoplane Flying in front of a World Globe, with the Washington Monument and the U.S. Capitol Building at the sides. This US stamp (Sc. #651) was issued on February 25, 1929 to commemorate the 150th Anniversary of the Surrender of Fort Sackville, the present-day site of Vincennes, Indiana, to General George Rogers Clark. 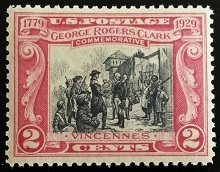 The central vignette of this 2 Cent stamp depicts the Surrender of Fort Sackville, from the 1923 painting by Frederick C. Yohn (1875-1933). Brigadier General George Rogers Clark (1752-1818) was the highest ranking military officer on the northwestern frontier during the Revolutionary War. He is best known for his celebrated capture of Vincennes in 1779, which greatly weakened British influence in the Northwest Territory. As the British ceded the entire Northwest Territory to the United States in the 1783 Treaty of Paris, Clark has often been hailed as the "Conqueror of the Old Northwest". The year 1929 marked the 50th Anniversary of the Invention of the First Incandescent Electric Lamp by Thomas Alva Edison (1847-1931) on October 21, 1879. The three 2 Cent stamps shown above (Sc. #654-56) were issued in June 1929 in three different formats, Flat Plate Press, perforated 11, Rotary Press, Perforated 11 x 10 1/2, and Rotary Press Horizontal Coils, perforated 10 vertically. The US stamp shown above (Sc. #657) was issued June 17, 1929 to celebrate the 150th Anniversary of the Sullivan Expedition in New York State, during the Revolutionary War. The 2 Cent stamp features Major General John Sullivan (1740-1795). Sullivan was later a delegate to the Continental Congress, the Governor of New Hampshire, and a United States federal judge. The Sullivan Expedition, commanded by Major General John Sullivan and Brigadier General James Clinton, was a systematic, scorched earth, military campaign, during the Summer of 1779, against loyalists and the Iroquois Indians that had sided with the British in the Revolutionary War. The expedition occurred in the lands of the Iroquois Confederacy, which is today the heartland of New York State. The US stamp shown above (Sc. #680) was issued on September 14, 1929 for the 135th Anniversary of the Battle of Fallen Timbers near present day Toledo, Ohio. The 2 Cent stamp features the Battle of Fallen Timbers Monument or Anthony Wayne Memorial, a bronze statuary group created by Bruce Saville (1893-1938). The lead figure is General Anthony Wayne (1745-1796), and he is flanked by the figures of a Native American and a frontiersman. The Battle of Fallen Timbers, August 20, 1794, was the final battle of the Northwest Indian War. The war had been a struggle between American Indian tribes and the United States for control of the Northwest Territory. The battle was a decisive victory for the United States, ending major hostilities in the territory until 1811. The US stamp shown above (Sc. #681) was issued on October 19, 1929 to celebrate the Completion of the Ohio River Canalization Project between Cairo, Illinois and Pittsburgh, Pennsylvania. The 2 Cent stamp shows Lock # 5 on the Monongahela River.